Scatterbrained Blogging: 7 Days of Skincare - Day 5 - Got milk? Now while you have been spared the history lesson - you haven't escaped biology. The secret to super-soft skin lies in the lactic acid found in sour dairy products and fermented fruits and vegetables, particularly fermented milk (the true secret to Cleopatra's baths) - this acid breaks down the protein in the skin, keratin. Keratin is the protein responsible for holding the upper most layer of skin together, particularly the drier skin. The lactic acid penetrates the skin deeper than almost any cleanser and help lift the dry, dead skin from the surface leaving you with luxuriously soft skin. I mentioned before I'm plagued with Keratosis pilaris and as I was frantically searching for information to rid myself of it (which is impossible) I came across advise that recommended I invest in a moisturiser that contained some form of lactic acid - Eucerin being of particular note. I found a small range in a local boots store - at the time I wanted to find a lotion as opposed to a cream because I thought I'd go through it too quickly. But oh how I was wrong. The cream is lovely and dense, and simply dipping my finger in is enough to cover my legs, and a finger tip is enough to cover my elbows and the upper half of my arm. The cream treats dry, chapped, skin and promotes the exfoliatation of rough skin. You can apply it as you need it, I put it on after a shower and in between if I think of it. I'm not in full-on Mission KP mode (catchy name, I know) yet - but simply incorporating this into my routine every so often has done a lot to tackle superficial dryness and my skin is all together softer. The 5% urea content helps penetrate the skin and the Lactate helps to moisturise and allow the skin to moisturise itself and hold on to moisture. As I said, a little of this cream goes a long way, and while I haven't used it on my face yet - it's my new go to for treating very dry skin. Usually in the winter my legs are incredibly dry, often tight and uncomfortable but this has that issue sorted and the effects are really long lasting too. 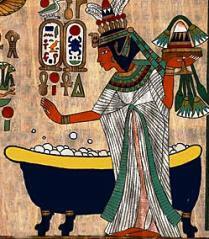 I may yet try a milk bath, has anyone else embraced their inner Cleopatra?